Volkl tennis has been producing high-quality tennis products for over 40 years. With their latest V-Feel line of racquets, the German brand is putting greater emphasis on comfort and performance levels for players. These new frames feature the signature Super-G grommet system, Revolutionary EVA, VCell, and VTex technology to make it more advanced than the previous Volkl racquet lines. The new Revolutionary EVA technology gives each racquet 35% more resilience, 15% more lateral stiffness, 35% more torsional strength, and 25% more shock absorption. VCell and VTex were added to each racquet for more feel and increased dampening, while the Super-G grommet system works to provide efficient energy return to the player. The great thing about Volkl is their ability to create racquets for various levels of players. 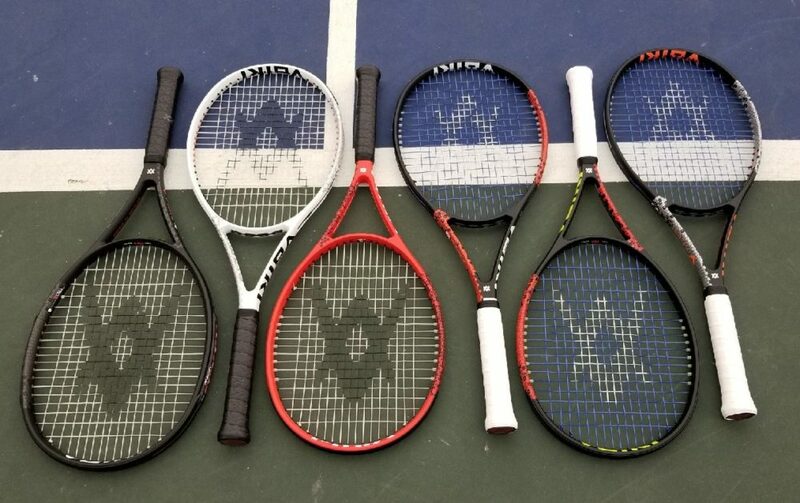 The V-Feel line has six adult and two junior racquets, but they all play very different from each other. You start with the V-Feel 4, which is the lightest racquet in the line, giving you the most power and comfort. Players will like this racquet for its oversize head (105 square inches) and extra length (27.6 inches) so they can track everything down. Next is the V-Feel 6, which has a similar swing weight to the V-Feel 4 but comes in a standard length (27 inches) and headsize (100 square inches). Players will like this frame if they want a little less power, but great feel and stability. Next up is the V-Feel 8 285G. This also has a standard length and head size, but provides players with a good combination of power and control in a lightweight frame. The V-Feel 8s will are all a little different because they have a 16 x 18 string pattern giving players a slightly different feel. I personally liked the V-Feel 8 300G and V-Feel 8 315G racquets the most out of this line. Both of these racquets felt fairly similar, but there is a true swing weight difference between the two. The 300G is a great tweener frame with a great combination of power and control that doesn’t need a lot of racquet-head speed. The 315G is a little bit more demanding for that racquet head speed. At first, it will not feel that heavy, and it will be easy for most players to place their shots wherever they want on the court. After an hour or two of hitting, though, you will start to feel that weight in the racquet. I recommend the 315G to anyone who likes a tweener racquet with a little more weight and can generate racquet speed for hours. 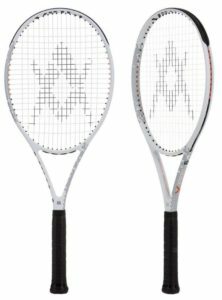 The most unique racquet in this line is the V-Feel 9. This racquet has a pretty hefty swing weight, but it plays with more spin and power than you can imagine. Players that have long, loopy swings and love to generate spin will truly have a blast with this racquet. High-performance junior players can also experience these new racquets with two of their own, The V-Feel 8 and V-Feel 9. 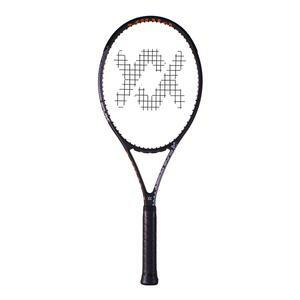 The V-Feel 8 Junior racquet is similar to the V-Feel 8 285G in terms of playability and look. However, the V-Feel 8 Junior weighs 235 grams unstrung, with a 25-inch length, 102 in headsize, and a 16 x 19 string pattern. This lighter frame is designed to help juniors develop their power and control as they grow. The V-Feel 9 Junior racquet is similar to the V-Feel 9 regular racquet, but has a lighter weight, shorter length, larger headsize and a 16 x 18 string pattern. If you are a fan of Volkl or a fan of comfortable racquets, then this line is perfect for you. 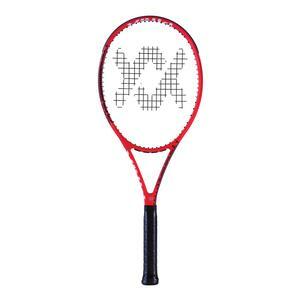 Tennis Express has demos of each racquet so you can find the right one for your playing style. Check out our video reviews above to get a more in-depth look on how each racquet plays. ← Style And Sport: The Best Of adidas Stella McCartney Collection!